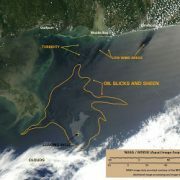 We’re getting requests from folks wanting to see the latest satellite images of the oil slick in the Gulf of Mexico. It’s been cloudy the last couple of days, so the NASA /MODIS imagery hasn’t been very good; the latest we posted was from the afternoon of May 2. But observers tell me it’s clear and sunny in the Gulf today, so we’re hoping the MODIS images this afternoon will give us a clear look at the entire slick. We’ll process and post those images as quickly as we can. Follow us on Twitter – we tweet as soon as we upload anything new – and keep checking here and in the SkyTruth image gallery. There is a gallery of radar satellite images here – radar cuts through the clouds and haze to show the ocean surface, and the slicks are clearly visible on the May 3 image. The drawback – this image only covers part of the slick. We hope to see some better coverage in coming days. We’d like to see a systematic, Gulf-wide monitoring program established, so that when emergencies like this happen the stream of images from multiple satellite systems is immediately available to all who want to see it – including folks like the Bay St. Louis-area local emergency response guy who just called SkyTruth for assistance. MODIS satellite image from the afternoon of May 4, 2010. UPDATE 5/4/10 6:30 pm – And here it is. Today’s MODIS / Aqua image features a break in the clouds (just barely) to reveal much of the oil slick. Fresh upwelling oil is apparent around the location of the leaking well. Long tendrils of slick and sheen stretch to the east and southwest; the total area of slicks and sheen, possibly including patches of open water, is 3,260 square miles. Nearshore, things get complicated: there are pale bands of turbidity, probably caused by the recent stretch of high wind and waves; and a few dark streaks and elongated patches trending northeast that we interpret as low-wind zones (wind shadow, the result of light winds from the northeast this afternoon). But there could be patches of oil slick obscured by these features. To the south, heavy cloud may also be hiding some of the slick from this ongoing spill. Hey John! Jim O'D here from Taos. Nice to see you on top of this. Question: is there a way to know how much oil is in the water column? How much oil is in each level? Where are those sections of the water column headed? 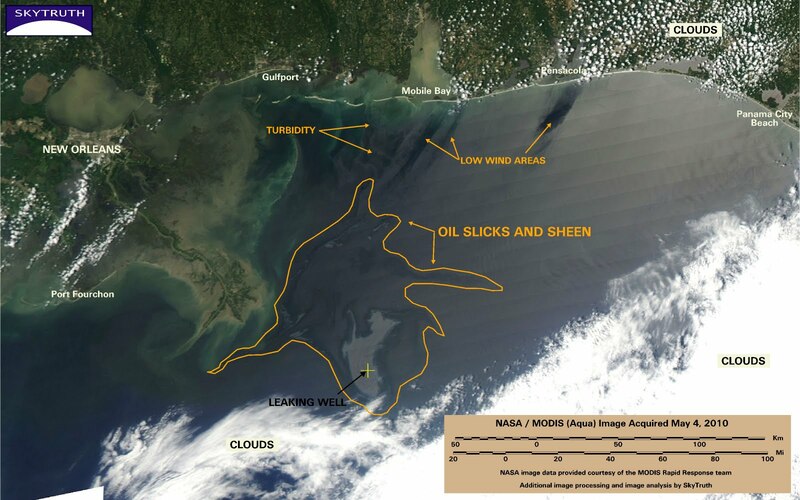 What I wonder is if the spill is much larger than we are seeing from sea surface images because currents at different levels in the water column are taking the oil far and wide UNDER the surface. JO – thanks for writing! My personal observations from research subs in the Gulf show streams of oil move pretty steadily to the surface, without spreading out widely until the oil surfaces. But it is possible there are subsurface currents adding complications to that simplistic picture. We need some oceanographers to chime in on this one. The crisis of the New Horizon's blow-out seems to be focused on the surficial effects, tragically these may also be the more superficial albeit showcase effects. As this is coming at the peak of seasonal plankton blooming in the area I strongly suspect that the largest effect is contamination of a vast ocean pasture with both the floating oil as well as the ‘dispersed’ oil, and dispersants. Dispersed oil while oft referred to as sinking is not really sinking it is just not sitting right at the surface making a film and accumulating. It may be even more damaging in it’s dispersed form in the top hundred meters, the domain of the all important ocean pastures. Decline in ocean pasture productivity is by far the most dire event taking place world wide. The declines as measured and reported are surely responsible for loss of those creatures that live on those open range ocean pastures. Annually ocean pasture declines well observed and measured are surely accounting for losses of hundreds of millions of tonnes of fish. Compare this with the annual world wide harvest of all aquatic species at under a hundred million tonnes and it is clear that ocean pasture declines are a far worse problem than over-fishing. If the Gulf ocean pastures are further degraded by this toxic oil and suffer large compounding declines then the fish and other marine species already in decline will decline even more. Somewhere, perhaps very near, is a ocean pasture tipping point. Perhaps Skytruth might look back at historic satellite data for the ocean pasture regions subjected to the impacts of this New Horizon blow-out and as the blooming season progresses this year we might see and measure the impact on the carrying capacity of those ocean pastures from this horrific blow-out and the efforts to mitigate it. It appears the very visible slick has diminished the last couple days. Anyone know if this is the cause of dispersant, and if so how fast that sinks? I mean…Has the bulk of the slick just submerged itself out of visible range? WH has a figure, 190K gallons, for the amount of dispersant deployed. Is it possible to derive an independent estimate of the volume released from that? Andrewo – we haven't found a way to estimate the dispersant use from satellite images. It sinks into the water column. Maybe with high-resolution hyperspectral imaging it could be done if the dispersant causes a measurable change in ocean color, but that would require an aerial survey — very $$. Thanks, that is helpful, but I didn't ask what I meant to very well. I meant to ask something more like this: taking the deployed dispersant volume at face value, what (if anything) does 190K gallons of Corexit (or whatever dispersant is being used) imply about the amount spilled so far? If there's someone else I should ask, please point me in the right direction. Andrewo – we don't know how effective the dispersant is. But we do know (from news account) that only a small percentage of the slick has been sprayed with dispersant, so there's no way to estimate the volume of oil spilled fromt eh amount of dispersant they've used. Zero correlation between the two. AND…as with the fracking juices this industry is dumping into our groundwater out here in the West, the recipie for the dispersants in proprietary. Dumping hundreds of thousands of gallons of toxins into the GOM to deal with millions of gallons of another toxin is the very definition of insanity. Are there any updates as to the spill flow rate? I would also like your opinion on the dome capping effort. What are its chances for success? Joe – no updates yet – we've seen no information to change out estimate of 1.1 million gallons (26,500 barrels) per day, so needless to say we really hope the dome works as advertised. But it's a difficult environment at 5,000'. We should know soon. I read your previous post with a lot of interest, and I like that someone out there is doing an independent assessment of spill volume. I wonder that the kind of assessment that Ian Macdonald did doesn't considerably overstate the volume of oil on the surface. Much of the aerial imagery that I have seen shows that the thickest bands of oil organize into tendrils that are surrounded by thinner slicks. Presumably this gets reported as Transitional or Dark on the Coast Guard map. But since those tendrils may only account for 10 or 20% of the area in a given region, and the calculation assumes that they account for 100%, the coverage is biased pretty significantly upwarrds. What do you think? What do other people think? Thanks Christoph – we are somewhat limited by the accuracy and detail of the Coast Guard maps, and the detail of the satellite images. But we're also not accounting for all the oil that has been removed or destroyed by 1) the fire on the platform, 2) the diligent work by crews on skimmer vessels, 3) the oil driven back into the water column by dispersants, and 4) the natural degradation by evaporation, ultraviolet breakdown, biodegradation, and mechanical wind/wave action. So we think our estimate is reasonably conservative. The 100 um value, for example, is still a very thin layer and, per NOAA guidelines, is meant as the average value within an area. Many of these dark tendrils have visible 3D structure and may have thicknesses in the mm range. So 100 um may not be an inaccurate average for the general area. That said, how to scale areas of the spill from 2D to 3D is a non-trivial problem. Our intent has been to show our methods to allow criticism. It would be good if there could be similar openness regarding how the 5000 bpd flow rate was derived. Thanks for your interest. Have you made any more analyses since the first one that John posted about? I'd love to see more. Gulf Oil Spill – New Spill Calculation – Exxon Valdez Surpassed... Gulf Oil Spill – Where’s The Latest Imagery?